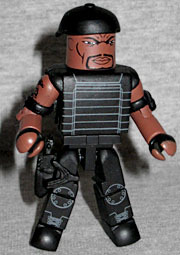 The Expendables should have been a one-off genre novelty, but instead it spawned a sequel (with another on the way, and possibly an all-female spinoff in the future), and that sequel got two toylines - including several Minimate box sets. The Expendables are an elite team of mercenaries, hired by Mr. Church to depose the dictator of the island nation of Vilena. With weapons specialist Hale Caesar, knife expert Lee Christmas and mission coordinator Tool on the job, it should go down without a hitch, but no job is ever that simple. Lee Christmas is Jason Statham, seen here in a rare movie role that doesn't involve him driving a car like a badass. He's named after a real soldier, but otherwise doesn't seem to have anything in common with him. Jason Statham is wearing all black, but there's a little bit of paint on his legs to create his kneepads and the top of his boots. He has a large bulletproof vest with painted details on the front and back, but if you take that off, his chest is painted with enough details to make it clear he's wearing a button-down shirt. There's a holster on his leg, and a black pistol in the tray next to him fits in there perfectly. The Jason Statham likeness is outstanding - put this head on a different body, and it would instantly be Chev Chelios, Handsome Rob, or the Transporter (who I'm sure has a name but, like most people, I just call him "Jason Statham"). Next we have Terry Crews, playing the ridiculously pun-named Hale Caesar. At last, I'm one-seventh of the way to completing my Brooklyn Nine-Nine Minimates display! Terry Crews is every nerd's second choice to play Luke Cage for Marvel (after Isaiah Mustafa, duh). He's wearing a bulletproof vest similar to Jason Statham's, but with a different design printed on the front. His boots are the same pattern, but his kneepads are rounder. He's not wearing a shirt under the armor (the chest is fully painted), so he may not have sleeves, but he does have the Ghostbusters' elbow pads. Like Jason Statham, he has a holster and pistol. Though he's bald, his head has a hole in the top. There really isn't a reason for it, either: yes, he has a backwards baseball cap, but the inside is flat - no peg. Mr. Church is Bruce Willis, smirking his Bruce Willis-iest smirk. His role had originally been offered to Kurt Russell, which means the team could have gotten their mission from Snake Plissken instead of John McClane. Obviously the likeness is once again terrific - this set has two squinty white bald guys in it, and yet you can tell them apart at a glance. Yet again he's wearing black, but in his case it's a suit jacket with no tie, so his white dress shirt and flash of pink skin at the neck add a little color. He's also got bare hands, unlike the last two guys we wrote about. And yes, weapons, but we'll get to that in a little bit. Hold your horses. 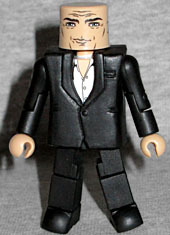 The final figure in this set is Mickey Rourke. I'm not sure whether "Tool" is his character's name or just a description. You ever wonder why Mickey Rourke in The Expendables looked 100% exactly like Mickey Rourke in Iron Man 2? Same skiny mustache, same tiny goatee, same gray, ropy hair... it's because he literally filmed all his scenes for Expendables while on a two-day break from Iron Man 2. 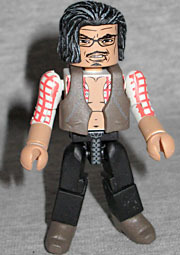 That worked out really well for Art Asylum, who could therefore just reuse Whiplash's hair for this toy. He's also got Mayor Lenny's vest and Wolverine's cowboy boots. Yee-haw! Props to the face designers for also including the toothpick sticking out of his mouth. And then there are the weapons. 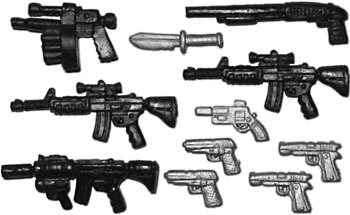 In addition to the black pistols that obviously belong to Jason Statham and Terry Crews, the set includes a bunch of weapons you can give to anyone. There are two Colt M4A1 Carbines, a shotgun, an MM1 grenade launcher, an M-16 with an underslung grenade launcher, two small silver pistols, two larger silver pistols, a silver knife, and a silver revolver. Judging by their positions in the try, we can assume the knife and revolver belong to Mickey Rourke and the two large silver pistols belong to Bruce Willis, but the rest can be given to anyone. 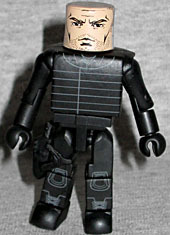 This entry was posted in Art Asylum, MMMR, TRU and tagged Minimates. Bookmark the permalink.